As an entrepreneur, you always have great ideas, fantastic prototypes, and a successful (hopefully) business plan. But until you have not created an attractive customized logo design that makes people fall in love with the brand, none of these would matter. In current fast-paced world of internet consumerism, first impression is everything. As an aspiring business man, you always need connect with prospects, build a sustainable and profitable business with a solid reputation, which is only possible by developing an unforgettable brand. Creating a logo design and developing it into a strong brand identity don’t happen at once. It is a layered process that takes time and business grows as well as evolves over the time. Since it takes quite a struggle to build a strong brand, logo design is the cornerstone of a brand identity. It shapes the brand story, differentiates it from other brands, and affects all visual branding decisions while your brand grows. You cannot afford to create and use a bad logo design as an aspiring entrepreneurs. So, here are some essential brand tips that can help in creating a winning brand identity. “A little knowledge is dangerous.” The proverb fits here perfectly. It is said so because getting too far into the process of logo designing could be harmful without educating yourself. It is crucial to take some time and enlighten yourself on topics like logo design, branding, and design theory. Doing so helps in making better decisions and conveying the right message through logo and the visuals shape the business identity better than nothing. In order to design a compelling and memorable logo design, you need to know the facts that make custom logo designs successful. If you want to design a logo that can grow and evolve with your business successfully, you need to think about the bigger picture. Precisely, you must not think of it as a necessary to-do item to complete before the launch of your business. Rather, it has to be action as a first step towards a strong and compelling brand identity of your business, employees, and customers. As aforementioned, your logo design acts as the foundation for all the aspects of business; it is very much important to develop a logo design that may not only look good but also represent your business and message to the target audience accurately. • Will the logo remain relevant in next 10 years? • Is the logo going to be flexible and scalable enough to use in a variety of places (billboards, letterheads, stationery, etc.)? • Is the logo delivering right message to target audience? • How does the logo fit into the brand story that you’re telling? • What are people’s feelings when they see this logo? Believe it or not, colors play a vital role in a brand’s image. Different colors have their own impacts on how brand is received by the prospective customers. Therefore, it is essential to understand the psychology of colors before selecting the right color for your logo. There are a million resources that might help you understand the science of colors. 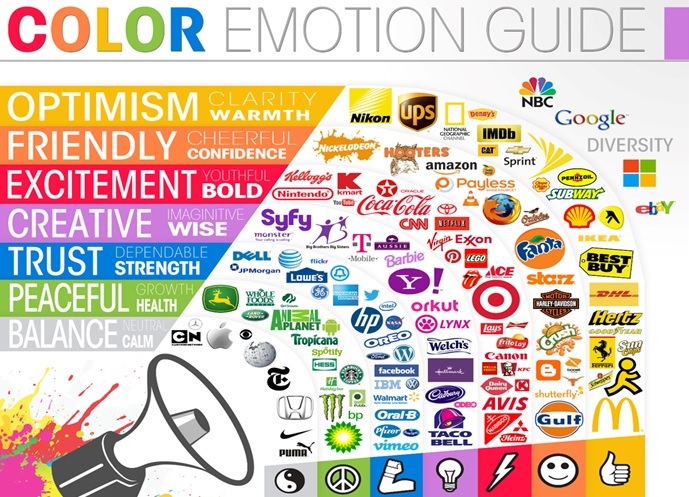 Here you can use this graphic that may help you pick the right color, present the right message, and drive the emotional response of people who interact with your business. When you at last begin to create a logo design for your business, the most important step that needs to take place is putting a development plan in place that’ll be guiding the person who builds your brand identity. Preferably, the development plan must start at the design phase and end up with packaged document of brand identity including brand assets, messages, other standards, and guidelines for reference as you build and help the brand grow. You keep on researching about the logos and branding in between the moments till finalizing the logo and brand identity helping for more growth in future as well. When you have reached the point of actually kicking off design phase for your logo, you will find few options. First, utilize your internal designer if you have one in your team already. Second, attempt to design it yourself with the help of some online tools. Third, you can hire freelance designers that may help you create the logo. If you choose to go through this route, Logo Crust would be your go-to choice. Whatever you decision is, it’ll truly depend upon your abilities, personal taste, and budget. It is always one of the primary tips that you must put an emphasis on versatility and flexibility of your logo design. As the logo of the brand will be attached to your business for many years, it must remain usable as the business grows. It should be flexible enough to be transferred into letter heads, print ads, t-shirts, digital spaces like social media channels, websites, email signatures, etc. Simple design: Using one or two colors at the most, a font that can easily be read, and leveraging the white space make a difference for the brand identity. Timeless: Keeping a logo too much trendy or including any type of pop culture references are the things that eliminate the originality of the design. Focus on creating something iconic. Incorporation of icons: Icons are simply the easiest way to represent the brand on social media where the section for profile picture is square in size. If you prefer not to force an icon into your design, make sure it could be scalable enough to fit for all the different formats be needed in future. Implementation on these tips will prevent the designer from being forced to redesign or overhaul the branding later. Meshal is a professional content writer with a passion of working for different niches. She loves sharing her meaningful thoughts with public through her writings. She has covered diversified topics of software industry, customized logo design, photography, nature, music, creativity, and more till date.